Some 2000 years ago Buddhism experienced a major reformation through a movement called the Mahayana, or "Great Vehicle," which dominated religious through in much of Asia for many centuries and still exerts considerable influence. 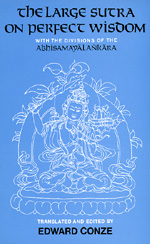 The basic Mahayana texts, sermons ascribed to the Buddha and called "sutras" in Sanskrit, discussed the "perfect wisdom." The "Large Sutra on Perfect Wisdom" took shape between 50 and 2000 A.D. in southern India during one of the most momentous outbursts of religious creativity in human history. Edward Conze (1904 – September 24, 1979) was an Anglo-German scholar best known for his pioneering translations of Buddhist texts.